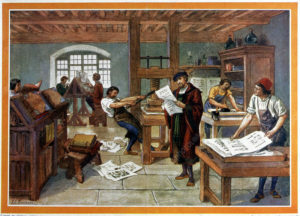 Johann Gutenberg’s first printing press was a revolutionary device. It changed the world. It is easy to think that the idea for the printing press sprung from the genius mind of Gutenberg full-formed, but that isn’t true. His inspiration came from the fact that he was able to combine four existing technologies–the wine press, moveable type, ink, and paper–into something entirely new. In this same way, the future of manufacturing will not materialize out of nowhere. It will be built using the existing technologies of today–advances in supercomputing, quantum computing, material science, artificial intelligence, sensors, 5G networks, and cloud computing. Oak Ridge National Laboratory houses the world’s most powerful supercomputer (capable of a mind-boggling 200 quadrillion calculations per second), and its next supercomputer –estimated to arrive in 2021–will be 7X more powerful. Meanwhile, IBM is now offering “quantum-computing-as-a-service” to paying customers. Both machines will radically speed-up and facilitate the creation of next-generation super materials–materials imbued with amazing new properties, including strength, flexibility, and conductivity. These new materials will then be improved by companies such as Kebotix and AutoDesk which are using algorithms, machine learning, deep learning, artificial intelligence, and generative design to optimize the functionality and production of everything from gears and bearings to automobile parts and aerospace components. These designs will then be fed into 3D printers that are growing 10X faster, more affordable, and ever more capable in terms of the types of new advanced materials that they can process. More exciting, these new printers will be capable of printing a multitude of materials within an existing product. This suggests that in the near future, parts will be printed with electronic sensors and antennas directly in them. As existing gears, bearings, and other machine parts are embedded with the ability to collect and communicate information, the functionality of both parts and machines will dramatically improve as these components and devices upload their data directly to the cloud. As future innovators leverage these new advances and then learn how to utilize next-generation 5G private networks, digital twins, and edge computing platforms, entirely new products, services, and markets will be created. Therefore, just as Gutenberg’s printing press wasn’t so much about lowering the cost of printing books as it was a revolution in the dissemination of knowledge, so too will the coming revolution in manufacturing be less about reducing the cost of production and more about imbuing existing products with the ability to disseminate information, insights, knowledge and, perhaps, even wisdom. The manufacturers that place themselves at the forefront of this coming revolution–by understanding and leveraging the convergence of supercomputers, quantum computers, advances in material science, artificial intelligence, the Internet of Things, 3D printing, 5G networks, and edge computing–will be those that thrive in the future.